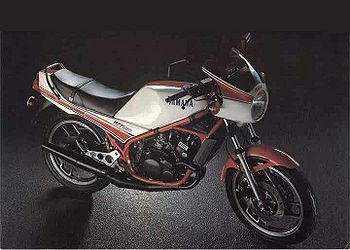 This was a supersport model developed with the TZ250 as its base. It immediately created a big sensation after its stunning debut at the 1979 Tokyo Motor Show. Its liquid-cooled 2-stroke, 2-cylinder engine pumped out high power equivalent to 140 hp per liter of displacement. This was mounted on a double cradle frame with a Monocross suspension and other features like lightweight cast wheels to produce unprecedented running performance. Even today it remains a legendary model with a devoted following. This page was last edited on 21 January 2011, at 18:38.